When I was starting out, I used to get super confused between different verbs and how to explain the use and effect of each one. 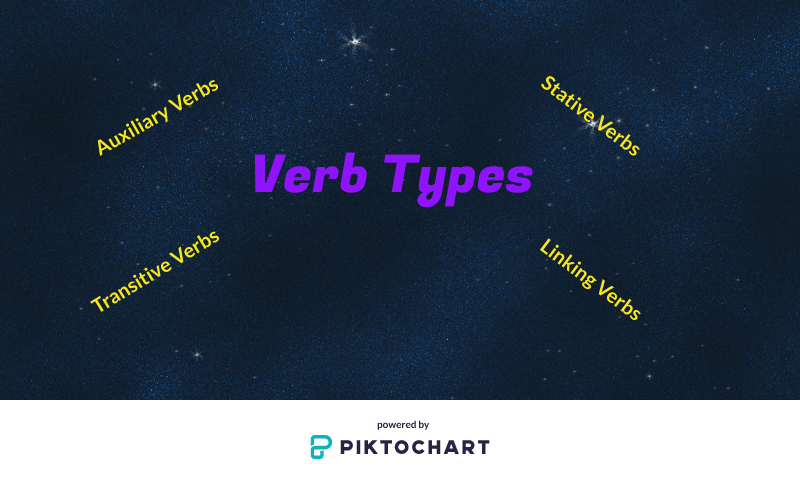 What follows is my quick guide to verb types, an explanation and some examples of each one. Any action verb that requires a direct object, is a transitive verb. A verb of this type requires a noun / noun phrase or a pronoun which refers to the thing or person affected by the verb. So it needs to be a doable activity such as; ‘Punch’ (1), ‘Tell’ (2), and ‘Drink’ (3). Here, our direct objects are in bold. 1. “She punched the vending machine to make the crisps fall”. 2. “My mum told Jason that he needed to leave the house”. 3. “I drank a lot of red bull last night, so I won’t have any today”! 1. I asked my mother to send me the letter. 2. I asked my mother to send the letter to me. If the verb is like this, with both a direct and an indirect object, there are also two ways of making a passive sentence. 1. She was asked to send Mary the letter. 2. She was asked to send the letter to Mary. By contrast, an intransitive verb is one that doesn’t require a direct object, including all non action verbs. Lots of students get confused with these verbs because they can be transitive in their own language. For example; ‘Say’. In English, it would not be correct to put; “She said me the story”. Some more examples of intransitive verbs; ‘Sit’ (1), ‘Smile’ (2), and ‘Suggest’ (3). 1. The priest sat down and looked at his congregation. 2. Jose was smiling at the cat running around the room. 3. The tourism board suggested going to visit the old lighthouse on the outskirts of the city. As we can see from these examples, the verbs do not carry a direct object, and therefore are intransitive. Uh Oh! – Verbs Both Transitive And Not! Well this is a bummer, but verbs which are both transitive and intransitive also exist! Have a gander at some examples. Perhaps when you are explaining this grammar, you could write the following sentences on the board. Illicit the difference in meaning that exists between the uses of the verb. A – She managed to finish the race with her broken ankle, it was a miracle! B – He manages a little shop in the east end of London. A – My mother is called April, but she doesn’t like it. B – They always call Mary names at school, kids can be so mean! B – My mother always washes and dresses at the crack of dawn. Modal Verbs seem hard, but they are not, I promise! The basic definition of these beauties is as follows. Modal verbs have no infinitive, and no past tense form. They are actually a form of auxiliary verb, more on that later. They also express modality, such as obligation, possibility and certainty. 1. She must do her homework if she is to get good marks. 2. He should quit smoking, I hear him coughing all the time. 3. The pastor at my church can throw a ball over 50 feet! If you need, or even just want(! ), to find out more about modal verbs, you can have a look at my previous blogs on the subject here. Auxiliary Verbs exist to help form other tenses and meanings. They don’t contribute to the meaning of the phrase, so much as serve to make moods and voices possible. Here are some common auxiliary verbs and their use. We use ‘be‘ to form progressive tenses and the passive voice. 1. I was running along the promenade when I heard him shout. 2. The play was written by Shakespeare and is considered his seminal work. We use ‘do’ to form many things! Does he play tennis in the mornings or the afternoons? I honestly do want to have lunch with you, but I am busy this week. Doesn’t he know how to cook chicken? We use ‘have’ to make perfect tenses. Such as the present perfect or past perfect. The coach has asked him to do 20 push-ups every night until the big game. When Rosie arrived, they had already finished the debate and were clearing up. Note: The English langauge also has the following ‘modal auxiliary verbs’ (explained above) to express modality. Shall, can, could, should, may, might, must, ought to, will, and would. Don’t worry, these are easy ones to grasp! They are simply verbs which we can’t use in a progressive tense structure. For example; ‘Like’ (1), ‘Want’ (2), and ‘Know’ (3). 1. I am liking your new jeans. 2. She was wanting some information about our new product. 3. I am knowing her at the moment. These are different from action verbs, in that they show a relationship between a noun and another part of the sentence, usually a word that describes said noun. There are a few examples, but the most common of them is ‘be’. Don’t worry, Miriam is here, she just arrived. My pet tortoise is very lazy, he only sleeps and eats. Other linking verbs include; ‘Feel’ (1), ‘Look’ (2), and ‘Turn’ (3). 1. This pillow feels weird, did you wash it properly? 2. The weather looks horrible, let’s stay in tonight. 3. My hair has turned green from the swimming pool! A nifty way to ascertain that you are indeed handling a linking verb is by replacing it with the word ‘be’. If the sentence makes sense and has the same or a similar meaning, we have got ourselves a linking verb! 1. This pillow is weird, did you wash it properly? 2. The weather is horrible, let’s stay in tonight. 3. My hair is green from the swimming pool! Any doubts? Please feel free to leave any comments you wish below, or contact me! Happy Teaching. Previous Crash Blossoms – A Wonderful English Quirk!